PVC and Polypropylene black and white mix, heavy yard broom, 330mm round wood back, double handle hole. 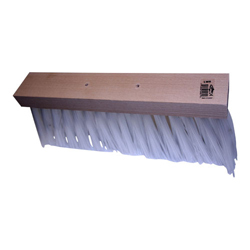 The two different types of the plastics in this mix make an excellent and durable heavy duty outdoor broom, very effective in wet or dry conditions. 355mm flat top broom, with chunky wood back and extra long (133mm), thick (1.29mm), springy, resilient Polypropylene fibres for cleaning pavements, gutters and gullies. 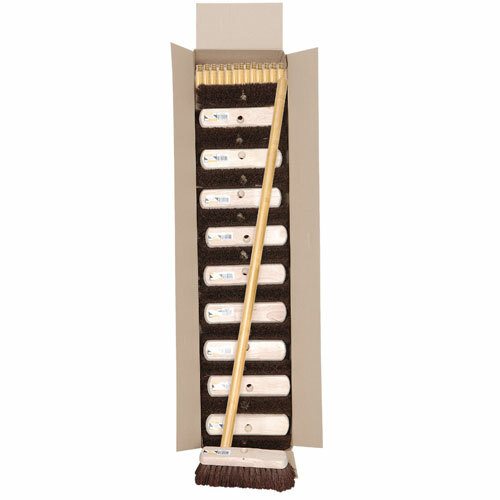 Every street sweeping kit needs one of these. There is no handle hole, this is complete with clamp. 457mm soft platform broom, wood back, filled black Coco fibre. Coco has average sweeping and wearing qualities. This well made, well filled broom, with longer than average trim length, makes the best of Cocos advantages and is typically used in dry, dusty conditions on concrete in garages, warehouses and yards, often in the construction industry. 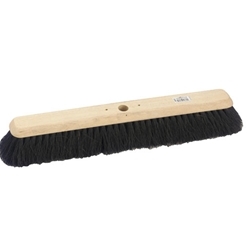 610mm soft platform broom, wood back, filled black Coco fibre. 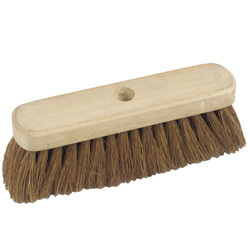 Coco has average sweeping and wearing qualities. 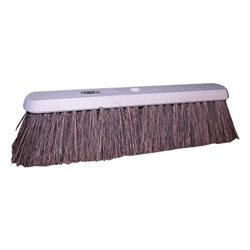 This well made, well filled broom, with longer than average trim length, makes the best of Cocos advantages and is typically used in dry, dusty conditions on concrete in garages, warehouses and yards, often in the construction industry. 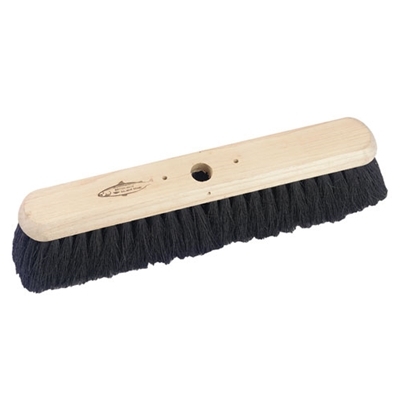 610mm medium platform broom, wood back, filled black Bassine/black Coco mixture. 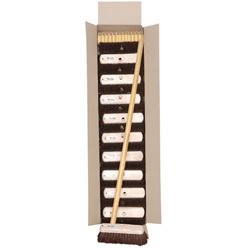 This brush is good for finer materials in dry conditions. 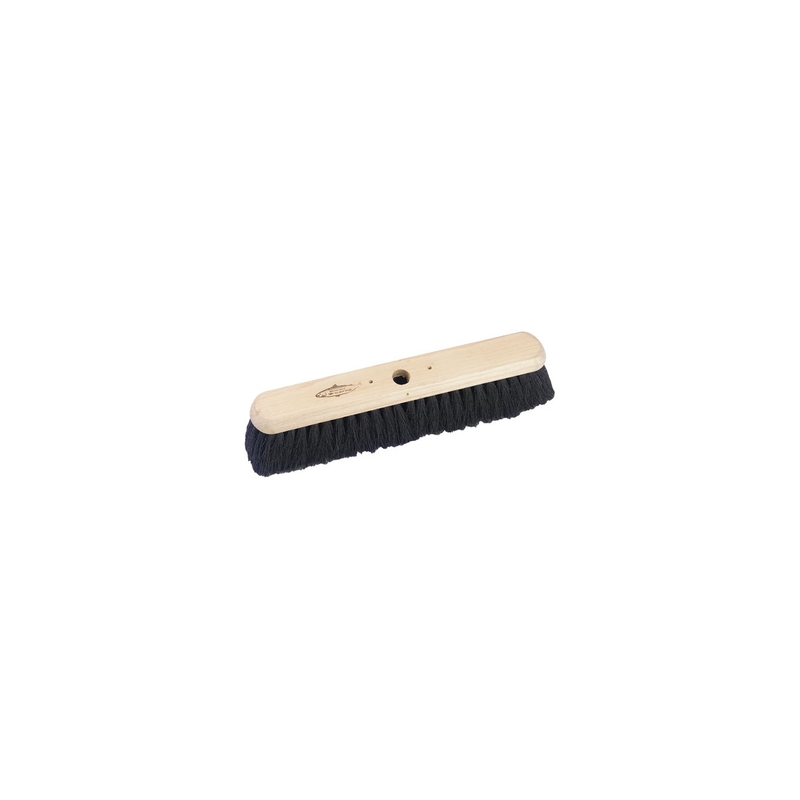 The Bassine gives the soft Coco more resilience and durability. Mixtures like this, with varying filament diameters tend to sweep more effectively, too. 914mm medium platform broom, wood back, filled Bassine fibre. Bassine is used for sweeping mud and rubble in dry conditions. It is durable, and does not crush easily. This well made, well filled broom, with longer than average trim length, makes the best of Bassines advantages and is typically used on concrete and tarmac, in garages, factories, warehouses and yards, and a great deal in the construction industry. 457mm medium platform broom, wood back, filled Bassine fibre. Bassine is used for sweeping mud and rubble in dry conditions. 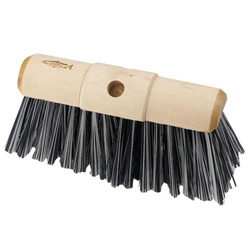 It is durable, and does not crush easily. 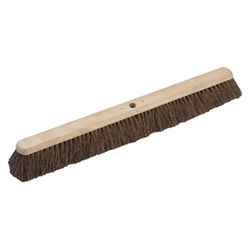 This well made, well filled broom, with longer than average trim length, makes the best of Bassines advantages and is typically used on concrete and tarmac, in garages, factories, warehouses and yards, and a great deal in the construction industry. 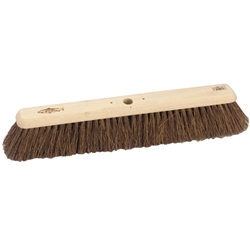 610mm medium platform broom, wood back, filled Bassine fibre. 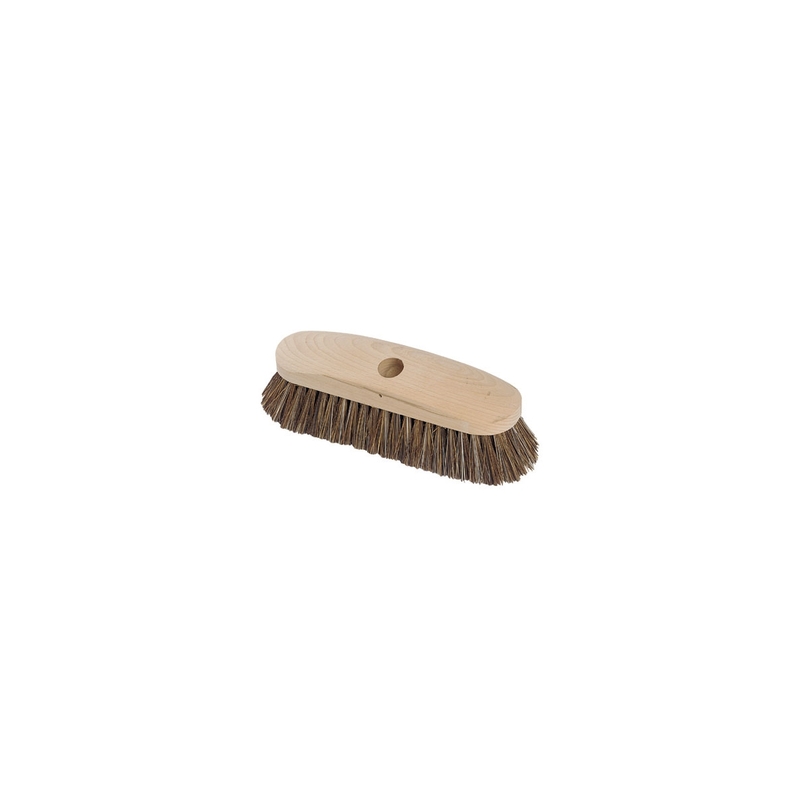 Bassine is used for sweeping mud and rubble in dry conditions. It is durable, and does not crush easily. 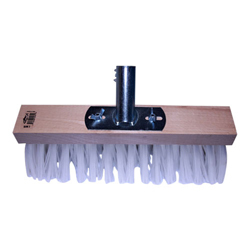 This well made, well filled broom, with longer than average trim length, makes the best of Bassines advantages and is typically used on concrete and tarmac, in garages, factories, warehouses and yards, and a great deal in the construction industry. 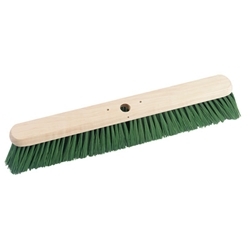 610mm stiff platform broom, wood back, densely filled stiff green PVC. 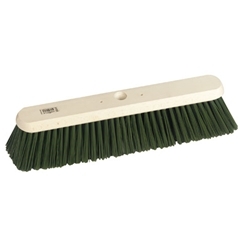 This brush is for rough outdoor areas, best suited to large quantities of mud and debris. 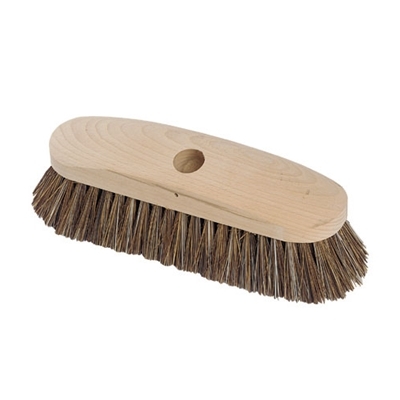 Natural Coco broom, 305mm wood block. This broom is good for dust and smaller debris in drier conditions, typically in building or industrial environments. 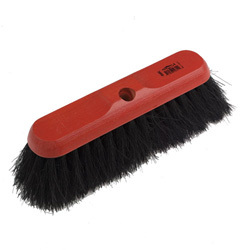 Black coco broom, 279mm skived wood block (red), soft, for dry dusty surfaces. 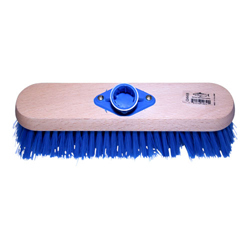 281mm socketed broom, varnished wood back, with plastic socket, filled soft blue PVC. This is an attractive kitchen brush for cleaning laminate , wood and tiled floors. 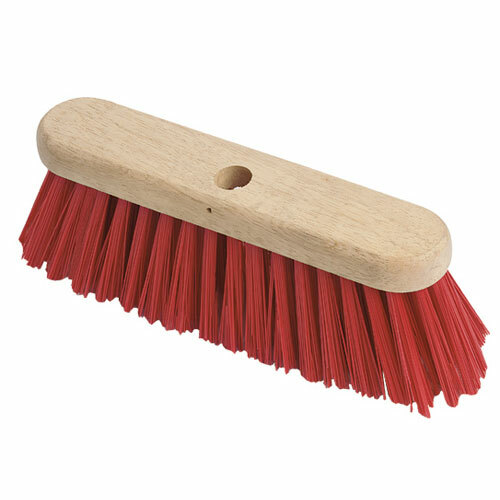 Red PVC broom, wood block. This medium broom is for rougher, muddy paths, patios, pavement and and open areas, in wet or dry conditions. It is similar to its socketed counterpart 24P but has longer material.